Editor’s Note: Be sure to check out our Black Friday Sale, going on now! 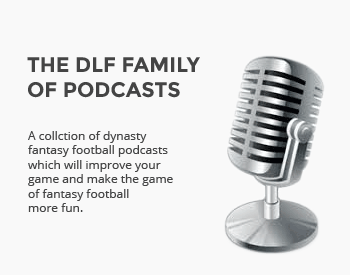 Since 2006, DLF has been a pillar within the fantasy community, staking our claim as the largest and most trusted dynasty-related site on the Net. Regardless of how long you’ve been with us, we still seek out every opportunity to share and delivery our value proposition to you. Haven’t played in a dynasty league before or don’t understand why you should? Be sure to check What Is a Dynasty League in addition to our Dynasty Essentials collection to better understand why, once you go dynasty, you’ll never go back! DLF desires to create the largest, most engaged, knowledgeable and helpful fantasy community on the planet. This focus has existed from day one and continues today. We understand that your results aren’t solely due to our content. It’s also about the people you surround yourself with. To that end, our community contains thousands of active, engaged and helpful individuals that complement our content offering. It’s the best of both worlds! DLF seeks every opportunity to individually engage with our members and readers and will always operate with a small business mindset of getting to know you and your needs as an individual. Many new faces have found their way to the dynasty format and many play in both redraft and dynasty leagues for maximum enjoyment. Redraft provides the challenge of drafting for the season ahead without fear or frustration of injuries during training camp, retirement or a newly drafted rookie sending the established veteran to the bench. Draft the best team possible and, win or lose at the end of the season, wipe the slate clean and do it all again next year. Those seeking a greater challenge and the desire to simulate the experience of being a General Manager of their very own team ultimately find their way to dynasty. Drafting and managing a much deeper roster, the annual rookie draft and the constant quest for discovering next year’s superstar before your fellow coaches even knew he existed are just part of the experience. In dynasty, once a player is on your roster, there he remains until YOU decide otherwise. That’s the key to the dynasty experience – once your roster is established, the players are yours season after season as you desire. Play, trade or release them as you see fit. The dynasty format provides the greatest challenge possible due to the engagement needed by each coach. Your long-term results will most certainly be affected by your continual research and strategic execution. Follow the news, contracts, injuries, incoming rookies, camp reports and pre-season action toward identifying the players that are tomorrow’s news stories. With the right amount of risk-reward strategy combined with the best fantasy resource at your disposal, your own dynasty awaits. At DLF there’s a reason we say: There is NO off-season! Quite simply put, the dynasty fantasy experience is for the NFL super-fan that desires year-round immersion. Each NFL off-season brings a new level of enjoyment and excitement. Have a poor draft or make a bad trade and you may be rebuilding for seasons to come. Or, nail the draft, be a savvy trader and dominate. What does your future hold? 50 dynasty-centric writers pounding out impactful, relevant content 365 days a year. There’s no group-think here. Premium forum including the popular “Ask DLF” forum for asking individualized questions. NFL News Source – Currently FREE! Lastly, we can’t do what we do without one very important piece: YOU! We’re not above asking for your engagement and patronage. Frankly, we’d like both and we work very hard to earn both. Whether you wish to simply be a part of our dynasty community or you’re ready to take your game to the next level with our Premium service, we hope you’ll be a part of what we’re doing at http://www.dynastyleaguefootball.com. And be sure to check out our DraftKings offer for the opportunity to get a full year of DLF FREE for simply becoming a new DraftKings player with a $10 minimum deposit. If you are an existing Premium member who would like to leave testimonial or you’re considering DLF and simply have a question, use the comment section below! I’ve decided to go with DLF another year. Could I put in a request for a deeper waiver wire for both offense and IDP. I play in a really deep league and really could use a n edge in finding that next “out of nowhere” player. DLF has been huge in helping me manage my team. Best source of dynasty info I have been able to find. Helped me find gems like David Johnson, DeAndre Hopkins, Devante Adams, Juju, Chubb and more. Saves me a ton of time prepping for the draft and their constantly updated dynasty ranks help me when I think through trades. Highly recommended!! !